Historical Background of the Book. About 80 years had passed since the Jews had succeeded in rebuilding the temple in 515 B.C. after the encouragement of the prophets Haggai and Zechariah. 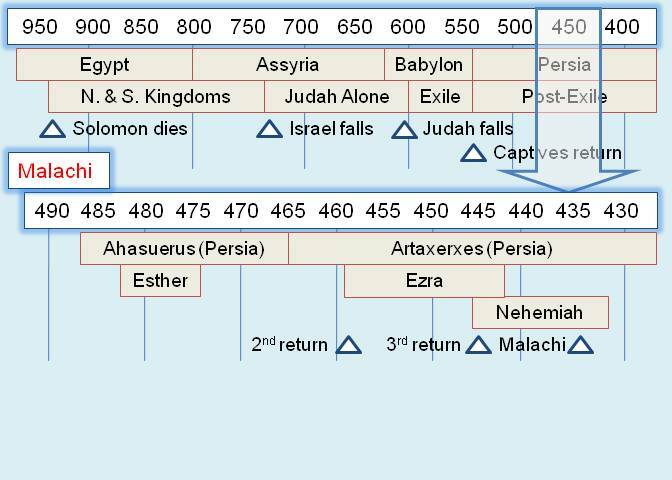 During this period, Ahasuerus became king of the Persian Empire (see the Book of Esther) around 480 B.C. Around 455 B.C., the priest/scribe Ezra had led a group of Jews back to Jerusalem and started a spiritual-oriented rebuilding effort around 455 B.C. (Ezra 7-10). About ten years later, Nehemiah the governor led a physical rebuilding effort to rebuild Jerusalem's walls (Neh. 1-6). However, the people were not prospering as predicted by the prophets. And they were starting to lapse again into a variety of sins, including mingling with and marrying foreigners, not paying tithes to the priests, offering up inferior or blemished animal sacrifices, and working on the Sabbath (Neh. 13). The Author and the Audience. Around 435 B.C. during Nehemiah's governorship, the word of the Lord came to Malachi, whose name means "My Messenger". Nothing else is known about Malachi. His audience was the unfaithful priests and people in Judah. Outline/Major Themes. The themes in Malachi are very similar to many of the Minor Prophets: God's love for His people, their unfaithfulness, their need to repent, and the coming Messiah & the "Day of the Lord". Rampant divorce and remarriage (ch. 2:16; Matt. 5:32; Matt. 19:9; and 1 Cor. 7). Failure to offer our best (ch. 1:13; Rom. 12:1-2). In addition, Malachi (and the Old Testament) closes with a very important prophesy: Mal. 4:5-6. Almost 460 years would pass before this would be fulfilled in John the Baptist (Luke 1:17; Matt. 11:14).